So if you’ve made a New Year’s resolution for 2018, your chances of achieving it look grim. The two most common New Year’s resolution goals are health and money. Which means that there are a lot of failed financial New Year’s resolutions year after year. My thought is that many people make very vague resolutions. Goals like “I need to save more” and “We need to spend less on eating out” sound very nice in theory. But are very hard to put into practice. Along with being too vague, many resolutions fail because we don’t have an understanding of where we are. It’s a cliched example, but you need a destination and a starting point in order to have accurate directions. Making vague resolutions is like picking out a destination without knowing where the starting point is. So you have no way of knowing if the direction you’re taking is going towards your goal or completely away from it. You need to know where you stand financially before you can make an effective goal, let alone reach that goal. I feel the best way to find your financial starting point is not by seeing how much you have in your checking or savings account. It’s not the equity you have in your home. And it’s definitely not how flashy your car is. The best way is finding your net worth. With the technology available today, calculating your net worth is very simple. If this is the only financial resolution you make this year, you will be much better off than you were last year. There is always discussion about what is considered a liability or an asset. Some people consider home value an asset. Some people don’t consider home value since it takes a lot of work to get money out of a home. The details are endless. But in general, as asset is something that adds to your wealth while a liability is something that takes away from it. Common assets include your checking and savings accounts and retirement accounts. Liabilities include credit card debt and student loans. So net worth is basically a snapshot of your financial health. But just like any snapshot, one picture doesn’t tell the story. A new medical school graduate has little in savings and hundreds of thousands in student loan debt. That will give him a large negative net worth. A high school student probably has some spending money but very few liabilities since he lives with his parents. So he would have a slightly positive net worth. Does that mean the high school student is more wealthy than the new doctor? The answer is no because net worth should be used to measure your financial GROWTH rather than a static number that looks at your wealth. In 10 years time, the new doctor will likely have a net worth light years ahead of the high school kid. So the key to wealth creation is to grow your net worth over time and grow it quickly. There are so many different opinions about how often you should track your net worth. Some say every month (some people even track it every day!). While others say once a year is enough. The key is to find a pace you’re comfortable with and keep it consistent. Personally, I check my net worth every quarter. I actually enjoy checking up on my accounts and seeing how they’ve changed. It also allow me to make sure there’s no fraud or any funny business going on in any of my accounts. And doing it quarterly is enough time to see if new strategies I’ve implemented are actually making a difference. Plus, most companies operate in quarterly statements so there must be some wisdom in it. As far as what high tech tools I use, an Excel spreadsheet and a Word document are my weapons of choice. I use the Excel document to help me calculate my net worth and I record the values over time in my Word document. Easy peasy. But one piece of technology that helps check my work and give me more insight into my net worth and retirement is Personal Capital. I’ve been using it for years to view my net worth and they have been getting better over time. All you need to do is connect your various accounts and Personal Capital will monitor them. They can’t make any transactions so there is no need to worry about security. They simply monitor your account value and have your net worth displayed nicely in graph form. Which is great since net worth growth is the true measure of financial wellness. Physically seeing it as a graph really drives it home. 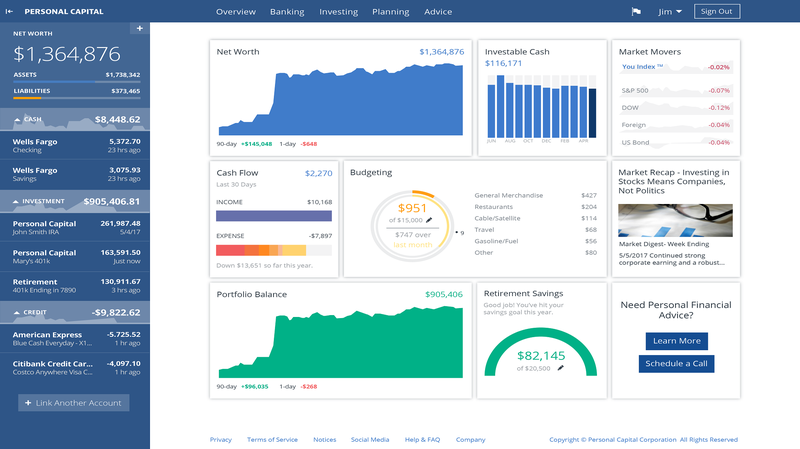 Other cool features of Personal Capital are the Investment Checkup and Retirement Fee analyzer tools. They can analyze the holdings in your investment accounts and tell you where you may be over or underweight. And they will also check the fees in your accounts so you can make sure you’re not paying too much. And it’s all free. There is an option to talk to a real financial adviser for a fee but that’s completely up to you. Most of the powerful features of the program are no cost. Deciding to grow your net worth is the best thing you can do to turn your financial life around. Thinking in terms of net worth rather than just making and spending more money will allow you to see your finances in a whole new way. Suddenly, paying a huge monthly bill for that fancy luxury car when a regular old Toyota will do just fine doesn’t seem that enticing. A decision like that can keep your net worth from growing the way you would like. Thinking in terms of net worth rather than just focusing on your checking account is the real way to get wealthy. Tracking your net worth consistently with Personal Capital is an excellent way to start the journey towards real wealth. I’ve been using Personal Capital as well and can totally agree that it’s a powerful tool! It helps to create excitement or anxiety in terms of where we are and what we can do to move forward in increasing our overall net worth (i.e, eliminating debt, reallocating investments and so much more). I’m glad to see more and more people seeing the benefits of tracking net worth. Tracking your net worth is a simple and powerful exercise. You gotta measure every so often to win.